Introducing the NEW Kluson Revolution F-mount 19:1 high ratio LOCKING tuning machine. 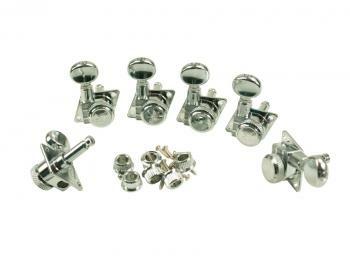 These state of the art, lightweight, diecast tuners are designed to directly retrofit the stamped F tuners that Fender uses currently on all CBS Fender era reissues. Uses the offset 2 screw mount with push in 10 mm bushings. All mounting hardware is included. String Post Overall Height = 1 in.